LOL no kidding. My next place is going to have a shop and a lift even if I have to sell off a kid to do it. Fabbing and fiting make an old man tired, even more so when you are laying down and getting up a bazillion times to do it. Seems like it takes me forever to get anything done, I'm still working on the front end because of shiny distractions in life. I'm looking forward to getting my hoist up in the new shop.....eventually. I'm not too old yet, 45 but still starting to take longer to get up off the floor then it used to, and then things start to hurt from doing so. Finally finished that new steering stabilizer I was talking about the other day. Be patient for the pics to load - my uplink is only 6Mbs, and normally runs around 5. Just got back from taking our trailer to a dog show in Sacramento. 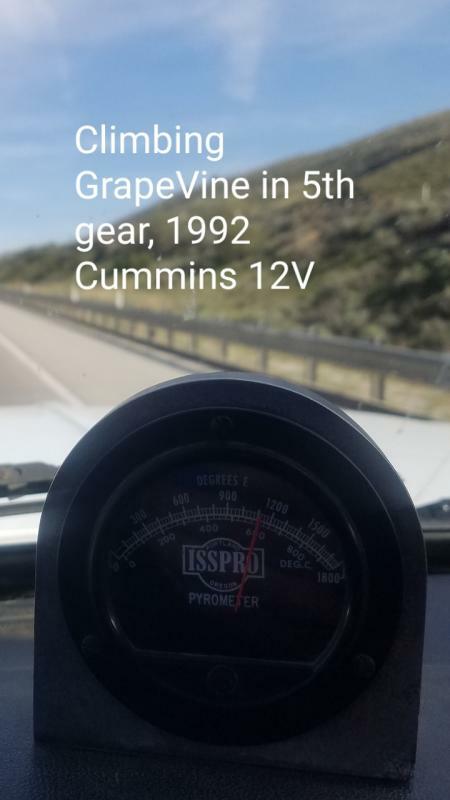 Was 966 miles round trip and The Grapevine was a non issue Up in 4th and 5th and never saw over 1,100EGT. The north descent is a little steeper and had to stab the brakes maybe 3-5 times but the south descent she held speed and think I had to use the throttle a little to keep from going too slow. We are DONE traveling for quite a while now after doing over 6,000 miles in the last few weeks. Plan on tearing apart the rear brakes and changing to the bigger Chevy wheel cylinders and getting a good bleed done on the rear brakes. I bypassed the abs a few days ago but the bleeders on the wheel cylinders were acting weird. One wouldn't stop letting bubbles out and the other wasn't even drilled to allow air or fluid to pass! I have the 1 1/8 Chevy ones in my shop and the big axle nut socket so might as well do the work. Well just had the worst time ever redoing the rear inner hub seals and swapping on some new brake shoes. I had the LH rear hub seal go out a couple weeks ago, diagnosed things and put an order in to rockauto. 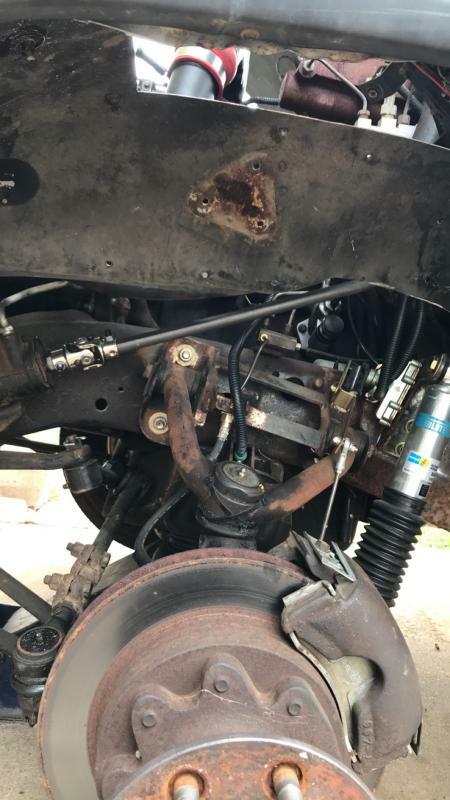 Parts arrived friday so thought I would get to it this weekend...new inner seals, new brake shoes, new shorter intermediate cable on the E-brake system (more on that later), and a new LH E-brake cable. Everything started well, go the driver side apart and started cleaning the oil off everything and was ready to start re-assembly so grabbed the new E-brake cable and it was not right! Checked multiple times against the current cable and nope wrong one....so did I order the wrong one or did rockauto? Well turns out I did not pay attention to where I was when i selected the rear cable....I was in the 93 Ramcharger section looking for a shorter intermediate cable when I selected the park cable. Went for a return and the shipping back was almost as much as the part....guess I have a spare for Sno-ball?? So then spent a couple hours farmerizing a fix to the current cable, couple old tractor trailer glad hand seals, and a small gear clamp got me back in business. Then installed the new inner seals, new shoes and all the clean hardware, everything was looking fine until I slide the drum on....would not bottom out easily. Thought this was odd but just tighten the nut on the spindle and it went on OK, adjusted the bearing end play and moved to the pass side. Then couldn't get the friggin drum off! Spent another hour or more poking around to get the adjust lock loose so I could back the wheel off. Finally got that done and proceeded to swap the new shoes and new inner seal....same issue as the other side woth the seal. By this time it was after midnight so called it a night, but that inner seal bothered me and my brain was munching on it until this morning when I got up. I just felt something was not right so I checked my order packing slip.....turns out I ordered front inner hub seals (SKF 27452)...Dooh!! So make a call to the local jobber with the seal number I "thought" needed, made the 70 min drive into town and back and went to install the new seals but thought I should try them on the spindle first.....good thing I did because these were wrong as well!! I had looked up 93 W350 inner hub seal with 12 x 2.5 rear drums (SKF 24917)....turns my axle is a factory 12x3 set-up so runs a bigger inner hub seal (SKF 28754)...so another 70 min drive back to town to swap and grab the correct seals. 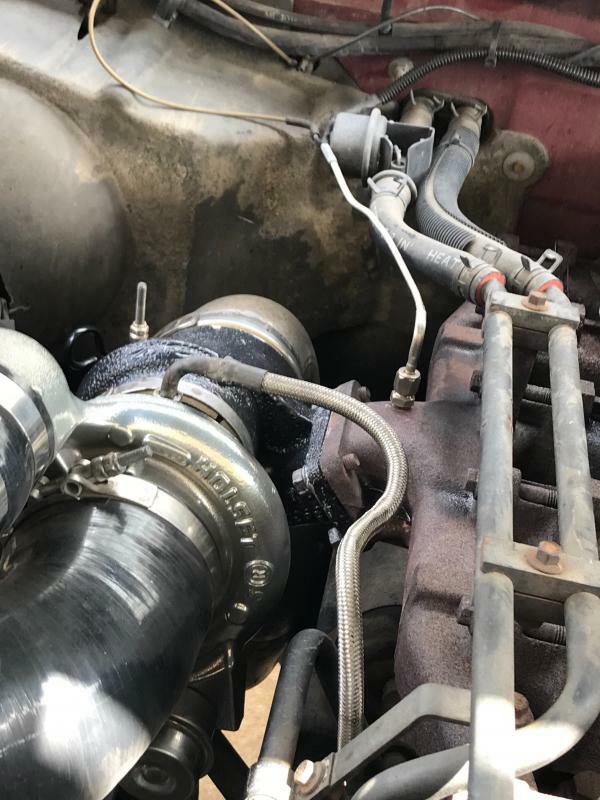 Once the seals were worked out it was just a few minutes to assemble everything, then about 30 min to set-up the rear drum adjustment and get the E-brake system adjusted properly. So moral of the story, check, double and triple check your on-line orders before placing them....I am usually pretty good about this but clearly I was brain farting that day. So the story on the intermediate cable is that I had been buying the 84 E-brake cables for the rear diff previously, but last set I ordered I mixed up and order them for a 93 1st Gen. Didn't realize until I Installed them and the intermediate cable was about 6" too long! So I pulled out my back yard engineering degree and made something work....not pretty but did the job. 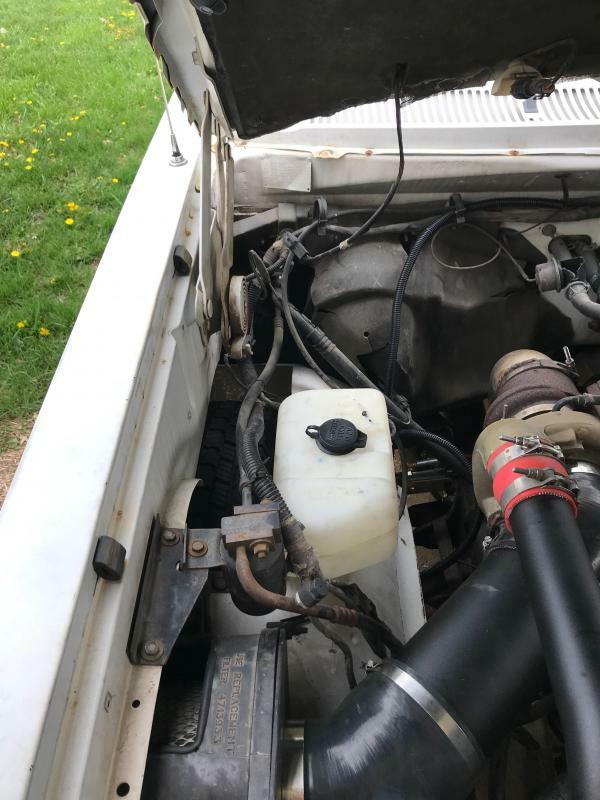 When I was searching for park brake cable I noticed a few shorter intermediate cables....so went out and did some measuring and found that a 42" cable (Raybestos BC93028) would allow me to use the 1st gen axle cables and hook up to the OEM crewcab main cable perfectly. I had never come across anyone mentioning this in all the years I have been reading and researching crewcab SRW long box builds. I've been messing with the he351ve for the past several days, I have been running it in a fixed position for the last year+ because of a problem with my old setup where boost worked against a spring to open it up. I figured it would have been carboned up and stuck but surprisingly it still moves freely . I recently setup an exhaust line to work against the boost pressure to regulate the opening of the slide collar, so now I've been playing with different springs to hold it in a neutral position. This morning I added another spring and ordered some reusable universal stainless fuel filters to keep soot from the exhaust line out of the pneumatic cylinder and drive pressure gauge plumbing. Truck one got 341 install wrapped up finally after rebuild, coating and impeller. Spool up seems better, but overall not worth it over my factory with 16cm housing. 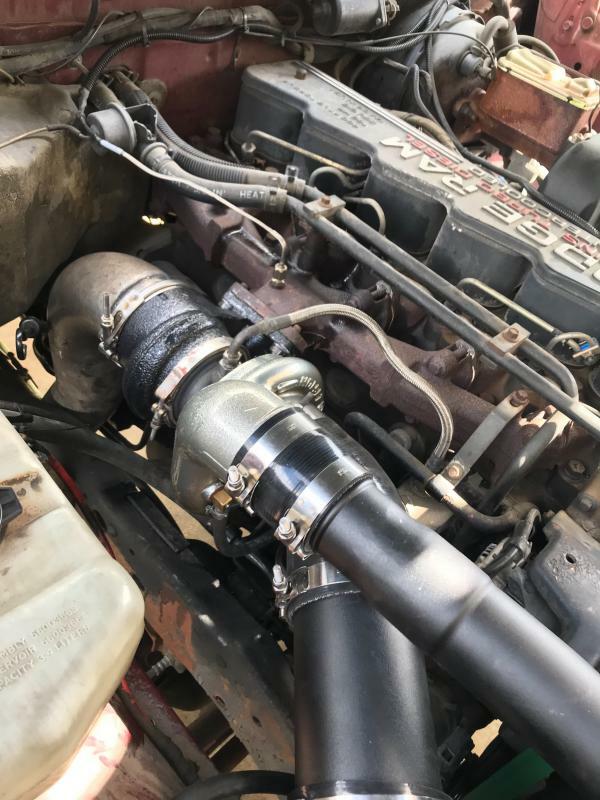 Truck two got a blantant copy of what Justin fonder did... cheapy steering joint and double d welded to stock rag joint flange. I had thought about doing this some time ago, but was afraid wouldn’t be able to remove it. No issues whatsoever, $50 well spent. Also got front fenders installed with cut out windows for clearance, along with a trimmed new-to-me washer reservoir.